One enters into this “shoubang” through portal curtains with eyes’ pupils narrowing and gazing upon Moroccan holey hanging lamps and recessed multi-colored bulbs. The Men’s Room, if you require it, for instance, is lighted as red as the sands surrounding Marrakesh. In this vertiginous atmosphere, you notice intricately curved black wrought iron bases, which support tables of inlaid tile surfaces. Long banquettes along the wall to your left are adorned with scarlet cushions. They are bolstered for human spines by emerald green embroidered pillows. An odd picture of an orange-capped trained monkey sits framed an inch within the wall, above it all. 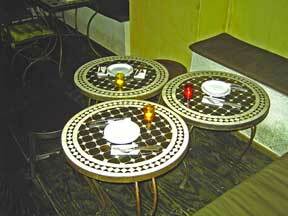 There is not much to your right except a half dozen more tables. 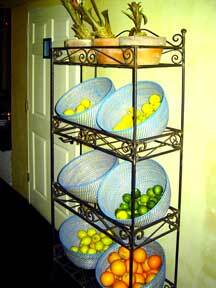 This “first room” is narrow and cozy, leading to a mid-restaurant display of fruit-filled baskets, and from there into a lengthy “second room” with a small chartreuse bar as its focus. Dark wide plank wood floors are at your feet throughout. Before you know it, a waitperson arrives with a welcoming tall shot-glass of spearmint tea. A sip corroborates that you are now in a different hemisphere. Your cerebrum is in Meknes or Fez, and your medulla is in a marvelous medina. The setting is startlingly authentic. When you compliment the staff on all the caring touches, they say, “very-happy-to-hear” with an affectation and accent last recalled in conversations at Jerusalem cafés. 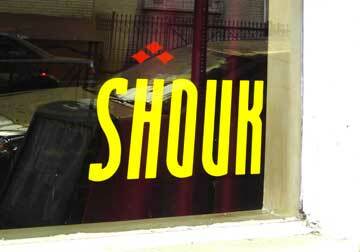 And, in fact, Shouk is the Hebrew word for “souk,” with its culinary emphasis on Israeli cuisine. The last first. “Kubbeh” are crusted carrot dumplings engorged with ground chicken and infused with cinnamon. The sweetness claims your tongue as it curls from the tension of tastebuds being tantalized. Lips become predatory as you smack them with delight. The dumplings are round golf-ball sized, and capable of being taken wholly into one’s mouth. Crush and swoon. Placate the palate with a piece of ground lamb flatbread whose coverlet is yogurt doused by mint. The flatbreads are three inch round pita-dough pizzas, inundated with Israeli inspired toppings. The lamb is coarse and crumbly, soured gracefully by the yogurt. Mint hints. The topping with egg, hummus and sunflower seeds assembled perfectly hard-boiled egg slivers and pastes them onto pureed chickpeas mixed with sesame oil. Sunflower seeds add an aftertaste that lingers without languishing. The “hummus and tahini” are served in a bowl in which the beige hummus surrounds the green parsleyed tahini. Most patrons simply swoosh a pita piece through the bowl and promptly deposit the voluptuous vegetarian concoction as close to their larynx as possible. Teeth are hardly necessary. Swallowing is involuntary. The owners, Israel “Yis” Tigay and Georgia Vass appear often to coddle Shouk’s customers. Tigay is renowned for his hummus-making and his humorous banter. Vass adds a background in Greece to the Mediterranean electric menu. “This establishment is still a work in progress,” says Tigay confidently. “We intend to make the interior even more intimate. We are always recrafting recipes to serve our neighbors really exquisite Israeli, Greek, Egyptian and Syrian delicacies.” Believe it or not, the talented new chef is Carlós Izagirre, a Venezuelan. Go know. The most different accoutrement at Shouk is the upstairs hookah parlor or “Sheesa Lounge.” The younger set seem to gravitate to water pipes in droves at about 10:00 p.m. One inhales fruit flavored smoke via a hose attached to a chamber whose contents are heated by charcoal. Tobacco leaves are shredded and soaked with honey or molasses or semi-dried fruit (apple, strawberry, mango, cherry, apricot, etc.). Some say it has a cooling effect upon the throat. I could not be hectored into so “cool” an endeavor. I will not mention the pungent “sweet and spicy cauliflower” ($7) nor the cold “potato and leek soup” ($5), except to say that the essence of each is distinctive, memorable and well worth the adventure. The “Israeli fries” ($5) with za’atar seasoning are a basketful of long, thin, dark, speckled potato spears piled to a mount. It will take two Yeunglings, a Guinness ($6), and a Red Stripe ($5) to quench your thirst thereafter. I cannot claim you will take to every item on the menu, but this nine months old eatery’s quality, conviviality and comfort make for a succulent souk. It will be interesting to observe its growth.